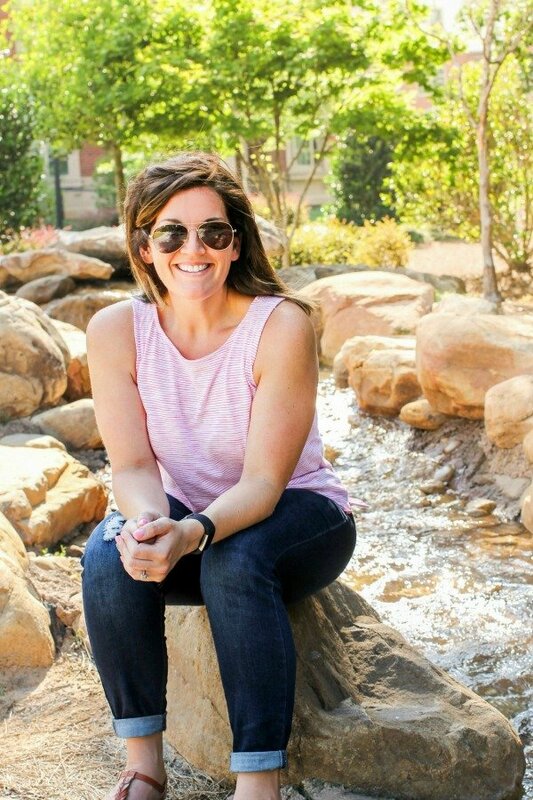 February 26, 2018 By Allyson 10 Comments This post may contain affiliate links. Read my disclosure policy. 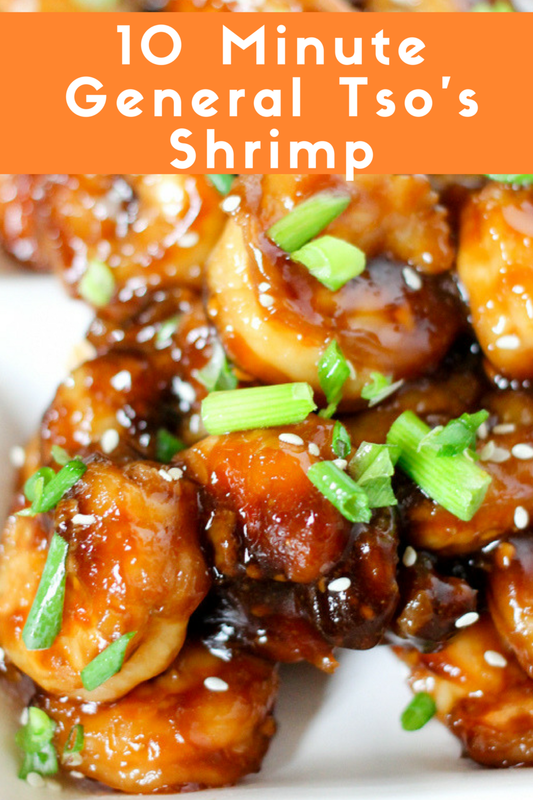 One Skillet General Tso’s Shrimp takes only 10 minutes to cook and is majorly delicious! With under 300 calories per serving, it’s the perfect healthy meal! General Tso’s is one of the most popular Chinese food menu items, so I know most people love it! 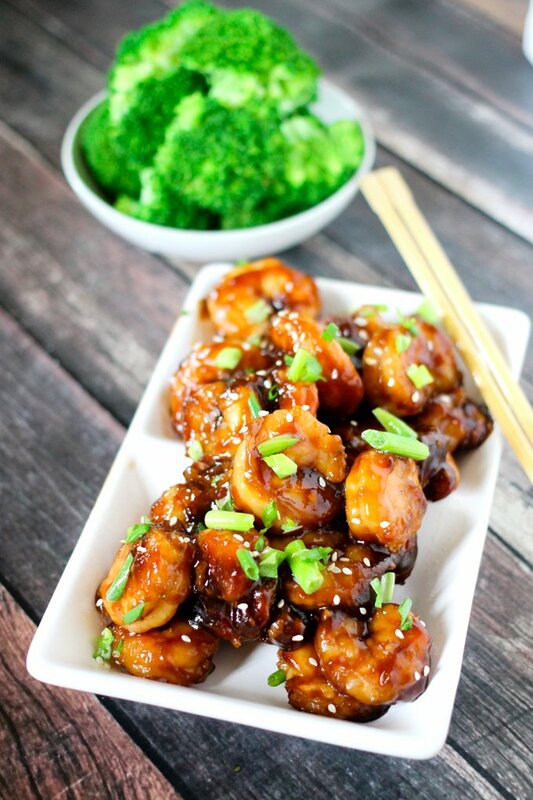 Making General Tso’s Shrimp at home allows you to know exactly what is put into your meal and saves you money on take-out. Not only that, but you also save time since it only takes 10 minutes to make from start to finish. Whip up the sauce, saute the shrimp, cook it up – BOOM – dinner is served! 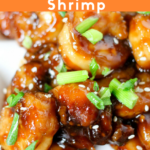 Being that this General Tso’s Shrimp only takes 10 minutes to make, it’s a very easy shrimp recipe! Combine all your ingredients for the sauce, set aside. Saute ginger and garlic in a large skillet (I like this one! ), then add the shrimp. Cook the shrimp for a minute or two, then add the sauce to the pan. Crank up that heat and let the sauce thicken up. Garnish with green onions and sesame seeds. Eat up! 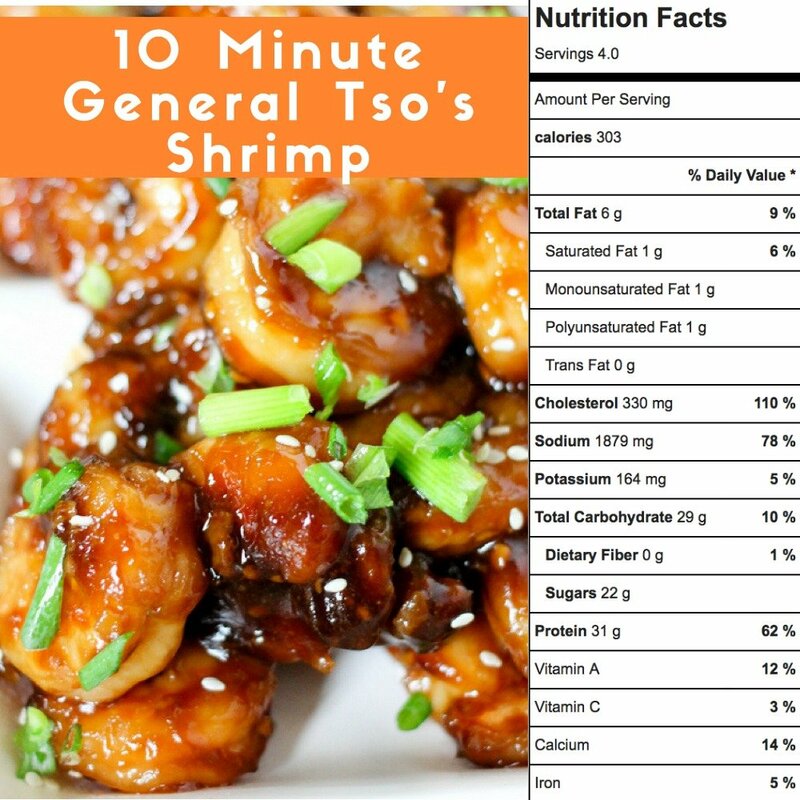 I love that you can keep General Tso’s Shrimp a very healthy meal! With 300 calories per serving, this is definitely a dish you can feel good about feeding your family. There are many options on how to serve it to keep it healthy! Serve General Tso’s Shrimp over a bed of quinoa for a punch of protein. Quinoa has 8 grams of protein per cup! Go a step further and make Quinoa Fried ‘Rice’ on the side! Want a more traditional Chinese side to serve with dinner? Whip up a pot of white or brown rice and serve the shrimp over the top. Don’t want to add a grain? Steam or saute broccoli, cauliflower, carrots, and bell peppers and serve along the side with some sauce over the top. 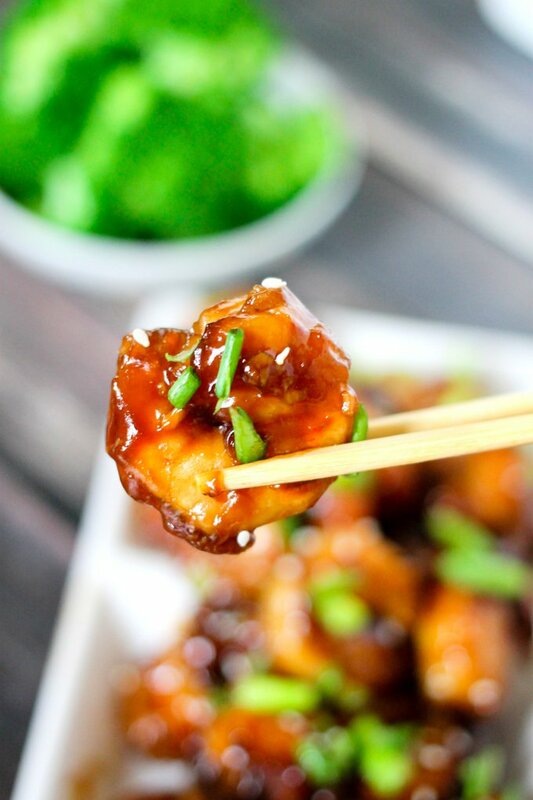 General Tso’s Tofu will have you forgetting about the meat and devouring dinner! This is the BEST vegetarian version of the famous General Tso’s dish. Instant Pot Honey Sesame Chicken Lettuce Wraps are a delicious healthy meal that cooks in just 10 minutes! Simple to make, family friendly, and so tasty! One Skillet Beef & Broccoli is a delicious healthy take on the classic popular take-out dish. The best part? It only takes 20 minutes to cook up! 10 Minute Spicy Shrimp Stir Fry is a super quick, delicious, and healthy family meal! 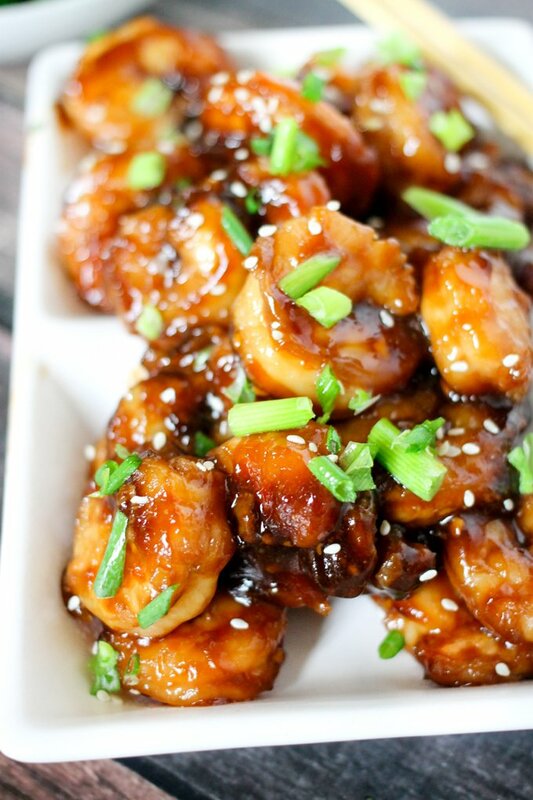 One Skillet General Tso's Shrimp takes only 10 minutes to cook and is majorly delicious! With under 300 calories per serving, it's the perfect healthy meal! In a small bowl add water, red pepper flakes, brown sugar, hoisin, rice vinegar, ketchup, soy sauce, and cornstarch; whisk to combine. In a large skillet over medium heat, add sesame oil and heat for 30 seconds. Add garlic and ginger and saute for 1 minute stirring constantly. Add shrimp and cook for 2 minutes. Whisk sauce again, then pour into skillet. Turn heat to high, and stir through the shrimp. Allow sauce to come to a boil, then reduce heat to simmer. Cook 2-3 more minutes until sauce is thickened and shrimp are cooked through. Garnish with sesame seeds and green onions. Serve immediately. A takeout favorite in only ten minutes! Sign me up! I know what I am making for dinner! This might be my new favorite way to eat shrimp!! Yum! You had me at 10 minutes. This looks so much better than take-out! And I love how easy it is to make! Forget ordering take-out, I’ll make this instead! My family loves shrimp, so this is perfect! Loving how quick and easy this is to get on the table! No need to order take out again! Looks so perfect and easy to make! How many spoonfuls are in the knob of ginger? Should be about a teaspoon!